November 15th is one of my favorite holidays in Japan. It’s not a public holiday, so we still have to go to work tomorrow, but it’s a cultural holiday like Setsubun and Hinamatsuri. 七五三 or Shichi-Go-San means 7-5-3, and is one of the days celebrating children in Japan. The holiday falls on a Tuesday this year, so the past few weekends have seen families with small children heading to their local shrines in droves. Beautiful kimono, hakama, and sometimes even Western finery is rented (or purchased) and many families also take it as an excuse for formal portraits. The day commemorates the passage into “middle childhood” and many people take their 7 or 3 year-old daughters and their 5 year-old sons to the shrines for blessing. The shrines are full of kids right now, and kid friendly signs have popped up as well. 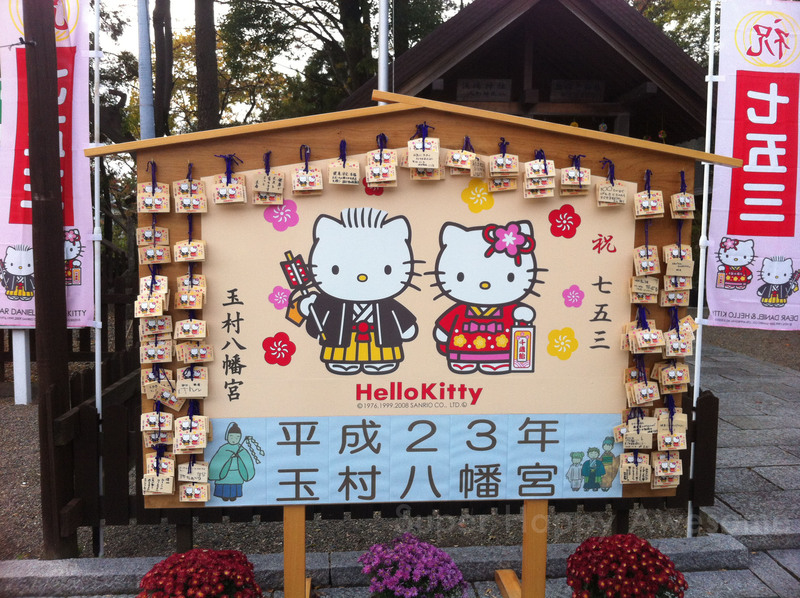 I spotted these lovely Hello Kitty ema votive boards at the local Hachiman Shrine in nearby Tamamura town. 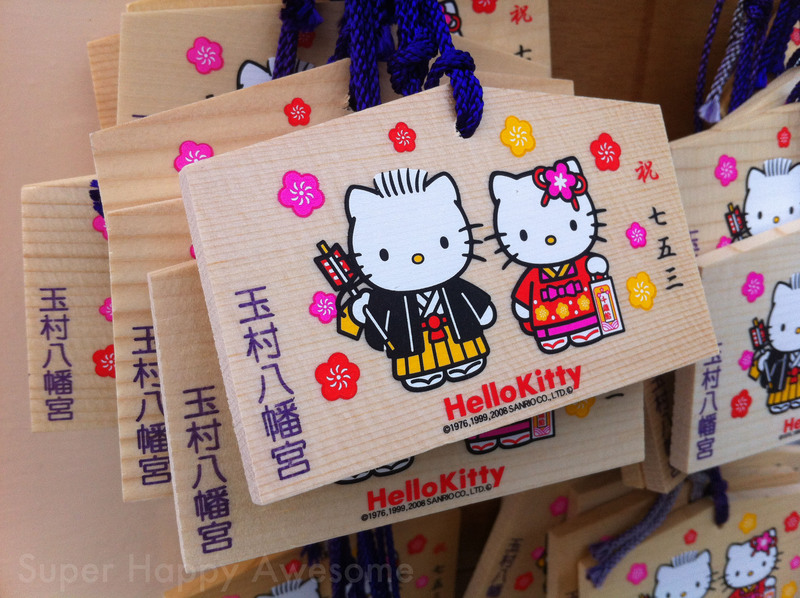 Kitty-chan and Dear Daniel are celebrating 七五三 in style! Have you ever celebrated Shichi-Go-San? Or seen the kiddies dressed up for it? And speaking of Hello Kitty, according to Twitter, she may in fact bleed Pepsi Pink. Oh, Pepsi Pink! This entry was posted in Japan, Modern Traditions and tagged adorable, children's festival, cute, dear daniel, Hello Kitty, kitty chan, shichi go san, 七五三. Bookmark the permalink. When I was in Japan in 2008, we were there for this festival. We saw many adorable children at the shrine, particularly Miyajima Island.